The leading LIMS (Laboratory Information Management System) for cannabis testing laboratories. Now Serving European and Canadian cannabis and hemp laboratories! Request a no-obligation, 30 days fully functional free trial of your customized LIMS today. Running a laboratory isn't easy. Make it easier with PharmWare! Join the PharmWare family for productiveness, compliance, and peace of mind at the lowest cost on the market. PharmWare is the most sophisticated web-based laboratory information management system (LIMS) and electronic laboratory notebook (ELN) platform built for the cannabis testing industry. Don't compromise the success of your laboratory: from Random Sampling to seed-to-sale traceability, we have it all figured out. Automated, compliant and always improving. Initially developed as an in-house solution for PharmLabs LLC (2011-2015), PharmWare is now 100% owned and independently operated by 42+0 Technologies. PharmLabs LLC continues as a prominent and satisfied client and platform evangelist. PharmWare is a comprehensive solution for high-throughput laboratories that are looking for a complete computerization of the laboratory process, from the initial point of sales to the final state reporting. PharmWare is privately deployed to your virtual server/database and comes pre-configured with the essential requirements of your state of licensing. Why pay for PharmWare and not use the 'free' alternatives available? We never said you shouldn't give it a try, but be aware of the risk of 'lock-in': migrations in and out of an IT solution can be time consuming. One word of caution: nothing is free. Why pay for PharmWare when I can build my own LIMS? We never said you shouldn't give it a try, but that's a recipe for disaster we have seen executed way too many times. For the same reason you wouldn't build a car: you know it "only" needs four wheels, an engine, and a steering wheel. Don't forget the brakes, safety standards, emission regulations, maintenance, and upgrades! built from the ground up by the cannabis testing industry, for the cannabis testing industry. We are the only cannabis lab in Washington state that has achieved ISO 17025 accreditation, meaning our lab's results meet the most trusted international standards for reliability. PharmWare has played an important role in increasing our workflow and improving turnaround times. Utilizing Pharmware as our Laboratory Information Management System, we have been able to efficiently manage the admin/client dashboard. The auto updates sent by text and email are awesome because our clients don’t have to guess when their results are ready. The QR Code generator for all COA’s are pivotal for ensuring our Certificates of Analysis are authentic and not forged. Integration with Weedmaps is seamless, and ease of use is a priority when choosing a Laboratory Information Management System. As a reference laboratory our main work product is the Certificate of Analysis. The flexibility of the PharmWare platform has allowed us to create a CoA that is a sales tool for us, and our customers. The burgeoning Cannabis industry requires the accurate compilation of large amounts of analytical data to ensure the health and safety of the products we are providing. 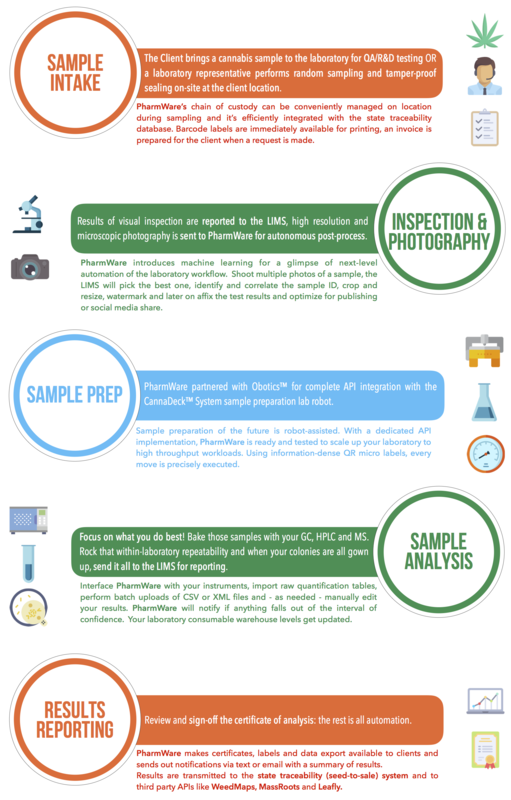 The PharmWare software platform provides the perfect solution to the Cannabis Testing sector. Integrating Harvestdate.com with PharmWare was clean and simple. The Dev team was very smart and helpful in answering questions. Response time for implementation new API endpoints was impeccable. Pharmware is straightforward and powerful for both labs and 3rd party developers. Obotics™ designed and implemented an ad-hoc, two-way integration between CannaDeck™ and PharmWare in record time. Definitely, a platform tuned to the demanding trade of cannabis testing. The more you run, the less you pay! Your monthly fee for 100 samples is USD. That's an average of USD per sample. ** A one-time setup fee might be required to provision, configure and run your private server for your laboratory if the included setup does not cover your laboratory specific requirements. Please contact us for additional information and a detailed quote. Training, support, backups, updates and troubleshooting included under the fair-use license agreement. We're far the most cost effective LIMS on the market. Export your data and cancel the service anytime if you are not satisfied. Evaluate the cost breakdown on a Google sheet.